Alphalicious | All things Cricut! You may have asked yourselves, between the difference of Provo Craft’s All Mixed-Up Cartridge and Alphalicious Cartridge. Well, the answer is this: while the All Mixed-up cartridge provides you with delightful and childlike fonts and phrases the Alphalicous Cartridge though, gives you fonts that have a touch of casual glamour. It also contains fonts that are funky and upbeat. Of course, you can also customize each letter and number to your desire. A cartridge designed by Rob and Bob Studios, which will help you enhance the look of your artwork. It also has a complete set of Alphabet, numbers, special signs and title phrases. This cartridge includes a short stack, crown tag, matchbook, crest card, shadow, and short stack shadow creative features. It will be able to help you cut numbers and letters in 11 different sizes, ranging from 1 inch until 5 ½ inches. The keypad overlay and the handbook is automatically included with any purchase of cricut cartridges. To be specific, this cartridge includes all uppercase and lowercase letters, numbers, punctuation marks, six shapes and 10 phrase/words. Phrases like ‘thinking of you’, ‘I miss you’, and ‘thank you’ are some of the phrases that can be found in this cartridge. This font cartridge measures approximately 9 ½ inch by 5 by 1 3/5 inch respectively, and can be used with the Original Cricut machine or the Cricut Expression. The uppercase letters in this cartridge has a little bit of subtlety in it but as for the lowercase letters they are the ones with more font character and most likely be the one that you would use often during your crafting projects. What makes it funkier is that you can add signs and symbols to your project. Signs include exclamation marks, hash signs, square brackets, percentage signs and many more. This is also one of the must-haves in your cartridge collection because of the versatility of the cartridge there is a lot of things that it can help you with. Surely, you will use this cartridge often than you think if not the all mixed-up cricut cartridge. If you want to make special cards, invitations and school projects that happens often especially if you have children or relatives you will find this cartridge very useful. Like all the cartridges and the cutting machines made by Provo Craft you will always enjoy every artwork experience that you will have your whole life. As long as Provo Craft materials are available in your home, you will never miss the fun. 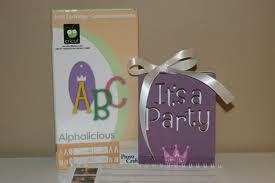 The alphabets are really cute and versatile for all occasions. i used it for a 1st birthday party and plan to use it again for other projects like cards and scrapbook pages. © 2012 Cricut Cartridges, Cricut Machine, Cricut Accessories!